Beautify your home – and reduce your utility bills! 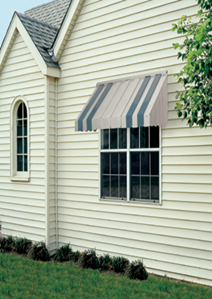 Awnings and door hoods can add character and charm to your home. But they can also help you reduce utility bills by shielding your rooms from the sun, and by creating an extra barrier against ice and snow. 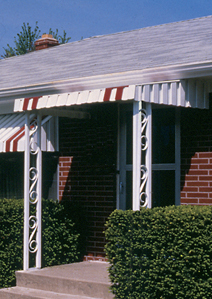 During warmer seasons, awnings work to block heat and the sun’s harmful rays. Window awnings can help reduce interior temperatures and shield your carpet and furnishings from damaging UV rays that cause fading and discoloration. And in the colder months, awnings protect windows from snow, sleet, wind, hail and rain. 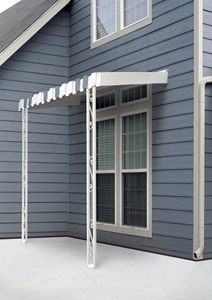 Our awnings are manufactured by Metals USA. 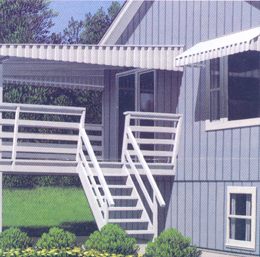 They offer a variety of long-lasting, maintenance-free awning components for their certified dealers. Certified dealers are awning professionals who can custom-build awnings on-site, in the size, shape and color that best complements your home. 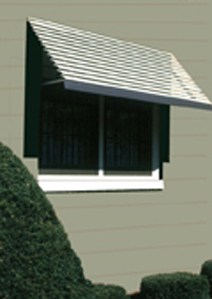 Aurora® Window Awnings, Door Hoods and Patio Covers are a decorative addition to any home. 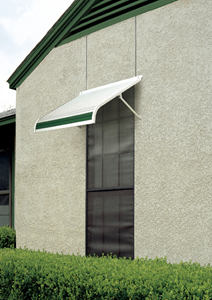 Aurora® Window Awnings also work to reduce glare and heat from the sun. In addition to a more energy efficient home, Aurora® Window Awnings become a protective agent keeping your interior furnishings from the damaging rays of direct sunlight. Available in a variety of designer styles and colors, Aurora® Window Awnings and Doors Hoods and Patio Covers can accommodate any architectural design. Door Hoods provide a warm welcome, a sheltered entrance all year long. Beautiful and practical, Aurora® Window Door Hoods will protect your entry way from rain, sleet and snow, as well as providing solar control. 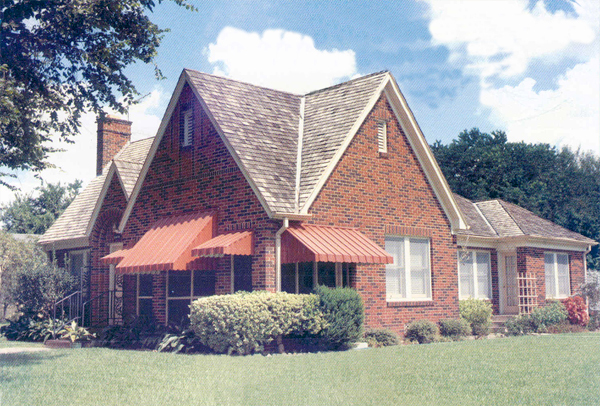 Perfect for parties, cookouts and play, Aurora® Window Awnings add shelter and shade to outdoor living. 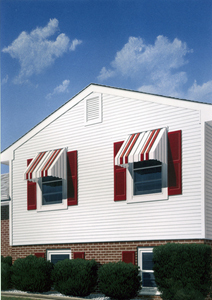 Aurora® Window Awnings are customized for your home; sized and shaped to suit your space. Custom made and installed, Aurora® Window Awnings and Door Hoods represent form and function at their best. While the top surface is available in a wide variety of styles and colors, the underside is always a crisp, clear white. No mechanical fasteners are exposed; the overall appearance is trim and neat. Aurora® Windrow Awning panels are chemically cleaned, conversion coated, then painted with a baked epoxy primer before a top coating of high quality polyester enamel is applied. The result is a minimum maintenance surface that retains its good looks. Overall, Aurora® Window Awning stands for quality and value...and that means economy, durability and beauty for your home. Your Metals USA dealer can fully engineer your Window Awning, Door Hood or Patio Cover to meet your local building codes. 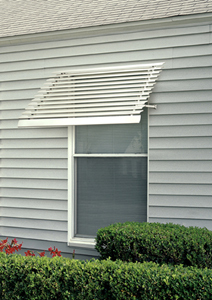 Aurora® Window Awnings have a natural venting action to prevent the build up of hot air against windows. The unique "pan and cover" construction helps keep rain, snow and debris from penetrating, without trapping heated air underneath. It also allows a soft "halo light" to filter into your home instead of dark shadows associated with other awnings. And, unlike fabric awnings, Aurora® Window Awnings won't stretch or tear, and they don't need to be taken down in the winter. 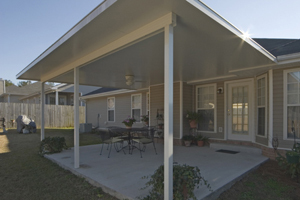 Aurora® Window Awnings, Door Hoods and Patio Covers are protected against peeling, blistering, flaking, splitting, rusting, chipping or cracking by a 10 Year Prorated Limited Warranty backed by Metals USA Building Products. For complete warranty information, ask us for a copy of Metals USA warranty covering Window Awning, Door Hoods and Patio Covers. Call us today and have our one of professional design consultants review your needs and recommend a beautiful room for you and your family.